Detox, low-carb and high protein diets— it’s not easy to make sense of any of it. Don’t waste time on the latest trend. Get back to basics and look at matching your eating habits with your needs. If you’re serious about shifting that scale, don’t rush. It’s easy to get excited about short-term solutions that melt off pounds in a hurry. Unfortunately, results such as these are a sure sign of a yo-yo diet—the kind that gets short-term results followed by a quick, not-so-welcome return of every pound you shed. Watch out for restrictive diets that ban certain food groups or focus on a single miracle food. Most foods are not intrinsically bad, nor is any one of them the solution to every situation. Removing any one food from your diet, depending on the food may trigger a vitamin deficiency, and that’s a risk you don’t want to take. Also, the more restrictive the diet, the less likely it is that you will maintain it. The key is to gradually change your eating habits. 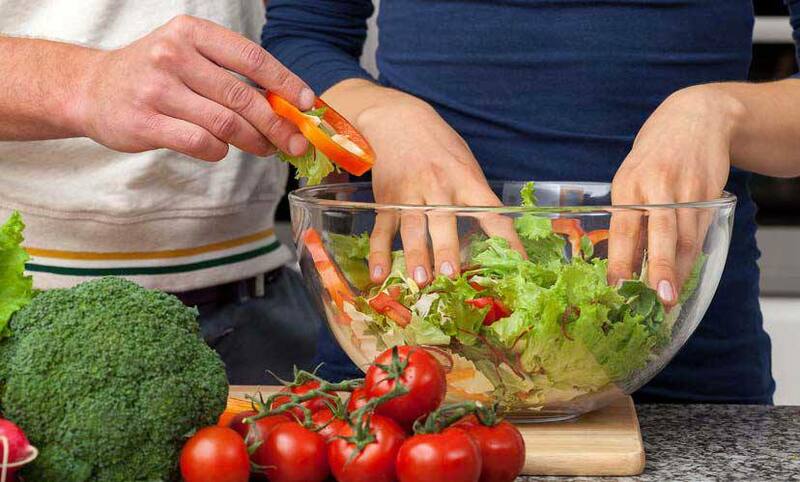 Healthy eating: the latest trend? Perhaps, but mainly it’s a way of life. Eat a balanced diet and stay active. Keep your diet low in fat, and rich in vegetables, fruits and whole grains. Try to buy fresh ingredients too. 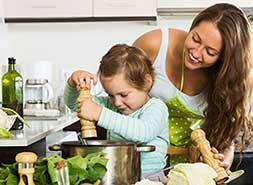 Ask your kids to help you with menu planning and dishes—you get a leg up when you encourage health eating for the whole family. See a nutritionist for support. You’ll get plenty of tips to make your life easier. 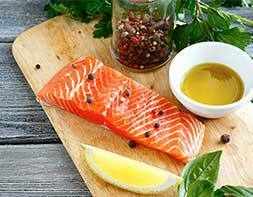 Foods rich in Omega-3 fatty acids such as salmon and herring are good for your heart, and eating lots of fruits and vegetables has been shown to prevent certain cancers. Don’t let yogurt, fresh fruit, and steamed vegetables get dull—think of all the un-salted spices, colours, and flavours you can liven them up with. A little imagination is all it takes to create dishes that are as attractive to look at as they are to eat! Deprivation isn’t fun. Eating is one of the joys of living life to the fullest. Blue Cross has your best interest in mind, whatever your age. We have the coverage you need to manage health care costs and to help you maintain a great quality of life. Find out about the free services and member benefits of our Assistance Program.